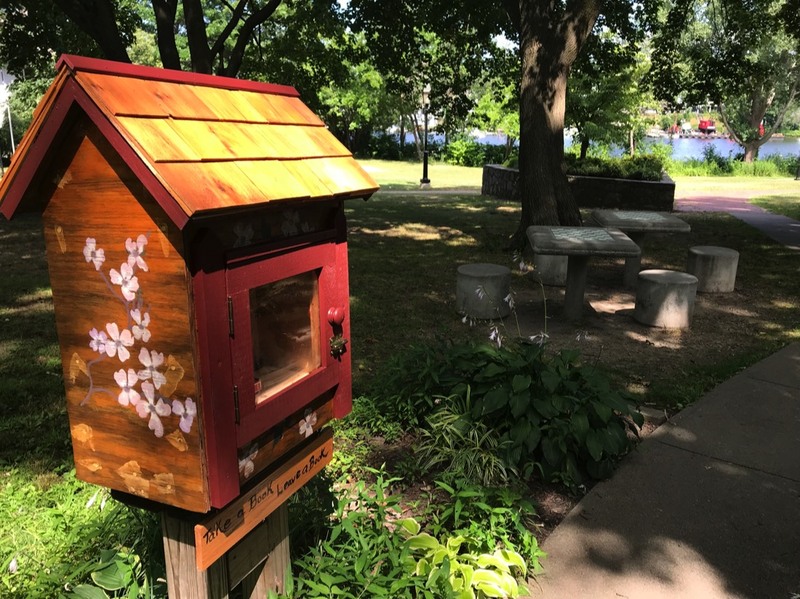 TAKE A BOOK, LEAVE A BOOK: Friends of Pawtuxet Village hosts three Little Free Libraries in Pawtuxet Village. They are strategically located in gathering places in the Village where neighbors share their favorite literature and stories. In its most basic form, a Little Free Library is a box full of books where anyone may stop by and pick up a book (or two) and bring back another book to share. Pawtuxet Park, Warwick (next to the chess tables) Inside you will find chess/checkers pieces and books for the entire family. Twice Told Tales parking lot, 2145 Cranston, in the Village. Books for all readers available. The Village Playground, Commercial Street, Due to continual vandalism to this library and the books inside it, we have removed it from this site. How Does The Little Free Library Work? Our Little Free Libraries offers a way to share good things to read—favorite books from your childhood or books you would recommend to friends; books that teach, intrigue and engage you. All of us can help by keeping this collection stocked with good reading material. Whose library is this? It belongs to everybody -- neighbors, friends, and people we don’t even know yet. Anyone can use it. That’s why we need people to take care of it. Take a book. If you see something you would like to read, take it. Look inside and see who gave it; who else has read it. Share it. Return it to any Little Library or pass it on to a friend. We support reading for children, literacy for adults, and libraries around the world. For obvious reasons, no “adult books” will be allowed in the library. +➤ What does a Library Steward do? • Stay up to date on Little Free Library activities, resources and initiatives. Be aware of opportunities to promote reading and literacy. Participate on behalf of Library users whenever you can, or find others who will. • Protect the integrity of the Library itself, its contents and the overall reputation of the Little Free Library movement. • Make sure our Village Library is orderly, in good repair, fun and interesting. Communicate with Village residents to get advice and ideas. Getting touch and stay in touch with other Pawtuxet Village Stewards. • In the event of inclement weather, a Steward ensures that the books are safe and clean; if they are wet or damaged in any way, a Steward removes them and coordinates the replacement of more books. During a snow storm a Steward ensures the area leading to and around the library is shoveled so that books are always accessible to all. • Be creative! Feel free to plant flowers at the bottom of the base, add a bulletin board/community message board or place a small notebook inside where Village residents can leave messages to you, to each other or just their general thoughts after reading a book. • For Stewards maintaining the Library in Pawtuxet Park, please take note that we will also be placing chess and checkers pieces inside the Library so Village residents can have full access to the chess tables at all time. Please check to make sure they are in the Library at all times. Encourage chess users to leave you notes or comments, such as asking them to tell you if there are any lost pieces. Encourage dialogue related to board games that Village families can use while they sit at picnic tables in the park.